Ultimately, I have one goal. I wish to get the average Christian back to a sincere searching of the Word of God. Let me begin by complimenting your desire to study the Scripture. Years ago, when I picked up the Bible to read it through for the first time, I was all alone in that ambition. I made a vow to God. (Let me pause here and say that I do not recommend that you make a vow to God on this matter unless you are absolutely certain that you are going to fulfill the vow. You can simply make an internal commitment. Deuteronomy 23:21-22 says: "When thou shalt vow a vow unto the LORD thy God, thou shalt not slack to pay it: for the LORD thy God will surely require it of thee; and it would be sin in thee. But if thou shalt forbear to vow, it shall be no sin in thee."). My vow was that I would read one chapter everyday until I finished the entire Bible and if I missed a day, I promised that I would make it up. Well, one chapter a day was not enough to satisfy my hungry soul. I began to read one chapter in the morning and another chapter in the evening. Then, the speed bumped up a little faster. One year, four months, and about ten days later, I finished reading through the Bible for the very first time. Hurray! Since then, I've had the wonderful privilege of reading through the Bible alone and with others. From these experiences, I will give you this advice and make the following observations. BTS will be extremely effective as a private study tool. There are some distinct advantages and disadvantages to studying alone. Disadvantages. Most of my studies have been in solitude. Let's face a painful fact and the single greatest disadvantage. Our enthusiasm is not always strong, and our self-discipline is not always unyielding. Will you be able to get through those tough moments alone? If you fizzle out, all other new benefits cease. So, as with any long-term goal, it is advised that you surround yourself with support. The wisdom God imparted to the locusts is displayed when they “go . . . forth all of them by bands” (Pr. 30:27). It is great to have a co-laborer if circumstances are accommodating (Ecc. 4:9-12). It may be that you team up with a family member or friend who lives far away but corresponds via email. The point is, you do not have to physically study together. The purpose is to create a network of support that will assist you when you get discouraged. Likewise, you can be of encouragement to your friend(s). If you're married, ask your spouse to join you. Get your parents or children on board. Contact a dear friend at church whom you feel is likeminded. If studying with a partner is not suitable in your situation, it may be at a minimum that you tell a couple of encouraging friends who will cheer along your progress. When everything seemed to be collapsing on David, 1 Samuel 30:6 says, “David encouraged himself in the LORD his God.” You will have to play this role for yourself. Another major disadvantage to studying alone is the limited insight you'll gain. If you have gain insights and your study partner gains insight, you can pool your thoughts which is a mutual benefit. “Iron sharpeneth iron; so a man sharpeneth the countenance of his friend” (Pr. 27:17). Advantages. What are the advantages? You may study at your pace and in the sequence you prefer. You may begin with the Gospels and then turn your attention to the Mosaic Law if you wish. You may read through as many or as few cross references as you want without throwing a fixed reading plan or adding to your daily study time. Answer keys are provided. When it is all said and done, ultimately you must learn the Scriptures with your own mind which requires your time, your concentration, your energy, your meditation, your obedience, etc. If you surround yourself with ten thousand brilliant theologians who were committed to reading with you, you must still be strong for yourself. The Bible repeats a principle: life is very personal (Pr. 9:12; 16:26; Eze. 18:20; Gal. 6:4-5; Rev. 22:12). If I win, I win. If I lose, I lose. Whether we are looking at temporal or eternal matters, I stand alone in the final analysis. If I maintain a healthy diet and exercise regularly, I will enjoy good health. Our sinful nature causes us to speak in the plural sense of “we” or in the third person of “he” when issues of fault or responsibility arise. Conversely, we tend to speak in the personal sense of “I” and “me” when it is time to receive praise or reward. I praise your courage. Be strong! 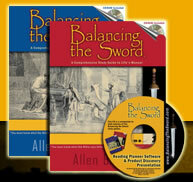 By His enabling power, you can accomplish all of the Balancing the Sword study program and more. There are many more things to share, but I'll have to let those be my last words for now. Please also see Study Techniques.